Geophysical down-hole surveys can be used to measure the small strain dynamic properties of soils by the effects these properties have on wave propagation. The relevant effects include amplitude decay (corrected for beam divergence) and velocity dispersion. 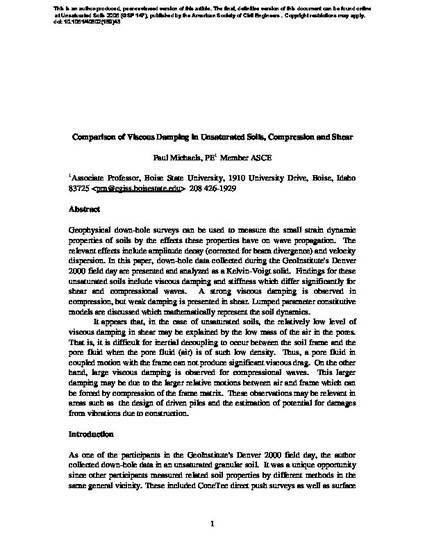 In this paper, down-hole data collected during the GeoInstitute's Denver 2000 field day are presented and analyzed as a Kelvin-Voigt solid. Findings for these unsaturated soils include viscous damping and stiffness which differ significantly for shear and compressional waves. A strong viscous damping is observed in compression, but weak damping is presented in shear. Lumped parameter constitutive models are discussed which mathematically represent the soil dynamics. It appears that, in the case of unsaturated soils, the relatively low level of viscous damping in shear may be explained by the low mass of the air in the pores. That is, it is difficult for inertial decoupling to occur between the soil frame and the pore fluid when the pore fluid (air) is of such low density. Thus, a pore fluid in coupled motion with the frame can not produce significant viscous drag. On the other hand, large viscous damping is observed for compressional waves. This larger damping may be due to the larger relative motions between air and frame which can be forced by compression of the frame matrix. These observations may be relevant in areas such as the design of driven piles and the estimation of potential for damages from vibrations due to construction.